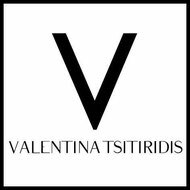 Valentina Tsitiridis is a Greek-born fashion designer now based in Belgium. The basis of her designs are deeply rooted in her origins and she often draws her inspiration from her numerous journeys abroad. Alongside a passion for embroidery and printed fabric, she's created and employed these techniques into her collection which focuses on architectural clichés, landscapes and textures. In 2015 she was encouraged to present her graduation collection at the Brussels Fashion Days Event where she received the special "Mad Award" for her unique fashion line. Riding high on her success in the following year, Valentina has also collaborated with Disney to work on an outfit inspired by the Star Wars saga, Rogue One . But Valentina's work doesn't just stem from one straightforward technique. She's constantly focused on developing her skills and broadening her horizons as a young designer. After completing her apprenticeship at PIECEOFCHIC, a fabric print house located in Brussels, she's further developed her skills for printed fabrics. Likewise, while participating at the workshop of Louise Kopij Jewelry, she's learnt to polish her sense of accuracy for the craft. All of her hard work and dedication to this point has led her to successfully create her eponymous brand with the first capsule collection of her flagship : the "V-clutch " .